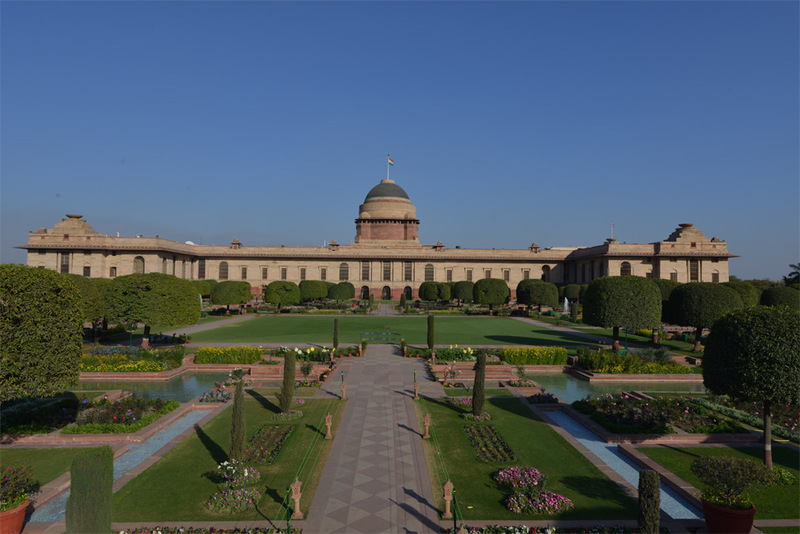 The Rectangular Garden is closest to the Rashtrapati Bhavan main building. Two parallel channels run north and south, intersecting with two others running from east to west.These water canals divide the garden into a grid of squares. At the intersection of these channels, sandstone fountains whose shape has been inspired by the Victoria Regia Lily, has water jets up to twelve feet. Moulsiri trees are neatly planted around the garden. The two main gardens of this area are the East Lawn and the Central Lawn. While the East Lawn is adjacent to the building and is in oblong shape, the Central Lawn is square in shape and its side measures 45 metres. 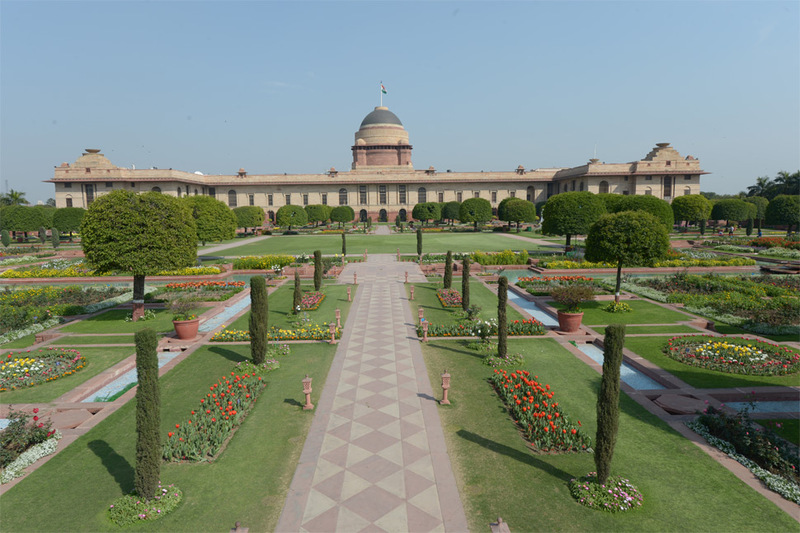 The Central Lawn of the Rectangular Garden is the main venue for the annual ‘At Home’ ceremonies hosted by the President of India on Republic Day and Independence Day. Eminent people from the public life, the diplomatic community, media persons and many guests are part of these receptions where they can meet the President and other dignitaries. Earlier ‘At Home’ ceremonies for visiting Heads of State were also held at the Central Lawn. That practice has however since been discontinued. During President Obama's visit to India in 2010, the Central Lawn was used to host the State Banquet. In 1977, the Central Lawn was also used to host the funeral prayer meet of India’s 5th President, Fakhruddin Ali Ahmed. There are terrace gardens on two sides of the Rectangular garden. In the centre of both these gardens is a fountain which falls inwards, making a well. At the end of these gardens stand two tall sand stone gazebos designed by Lutyens. Gazebo,a structure often built to provide shelter and shade in large open areas, has been given a natural shelter at the Mughal Gardens by the four Putranjiva roxburghii trees that are planted at its four corners. There are narrow water chutes running through this garden and joining the main canals, bearing peculiar resemblance to the Mughal architecture where water plays a key role. Creatively designed, these water chutes flow through several levels of steps and have fish-like motifs carved on them, giving an impression of fishes in water.